Bits and Pieces...: Valentine's Day and a Giveaway! Tomorrow is Valentine's Day. It's a big event in our house! I always make a filet mignon dinner and tasty dessert. And there are little treats for everyone. This is my page that is in the Award Winning Style article. I journaled about our dinner tradition. One of the things that I do each year is place a little gift on the dining room chairs for everyone. Ryan is always so excited and can't wait until dinner is ready so he can run in and get it. This one has lots of Prima on it. Speaking of Valentine's Day, I thought I'd share a quick little project that I pulled together today. I was organizing my scraproom this weekend and took all of my washi tape out of their packaging so they could go into their new home - a vintage glass dish. Anyway, I felt bad throwing away the 'clamshell' packaging (just learned THAT new term at CHA, BTW) so I decided to reuse it to create these little goodies. I made them for my team at work. See those little yummies inside? They are white chocolate and raspberry kisses. OMG....they are amazing. I had to go out and buy a second bag so I could hide it and snack on them! :)I used Fancy Pants papers for this. So, now for the giveaway. Leave me a comment by Thursday, Feb. 16, telling me about your favorite Valentine's Day tradition. 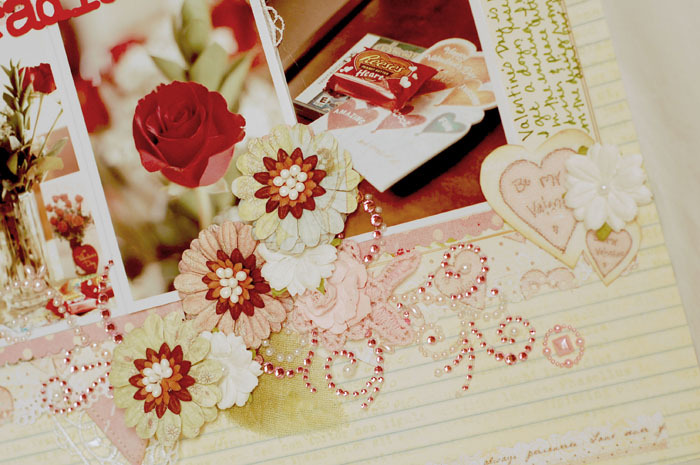 I'll choose one person and will send them the February issue of Scrapbook Trends along with some goodies of my choice. Just saw your spotlight on the Create blog! Congrats, Anabelle! So happy for you and for all of your awesome recent successes! I just love seeing your work and I absolutely adored your wedding card in the March/April Paper Crafts - gorgeous! Hope all is really well! WOW! What a divine layout, Anabelle! Love your colour palette and all the tiny details! Well congrats on the Scrapbook Trends...but I can see why...your work is gorgeous! !...Your layout is beautiful....!! Usually our Valentines Days are the same with slight changes...my friend and I cook a fab supper for our guys...but this year her hubby is away on flight training, so it's just the two of us...so will figure something out for us....we usually go to dinner about a week after as he hates crowds....kind of boring, aren't we...LOL!! I made gifts like that a few years back, only... mine were kinda ugly. Now I'm thinking I might have to give it another go, thanks to this reminder. Yours are just LOVELY!!! Congratulations, Anabelle- well deserved! Your work is always beautiful and inspiring! Cute idea with the clamshell containers as well. While my hubby and I don't celebrate Valentine's Day, I always make my "at home" kids a project with paper- this year it's a banner that each of them can hang on their wall. In years past I've done frames, goodie buckets and cans, or pockets. It's just a fun way for me to show them how much I love them. 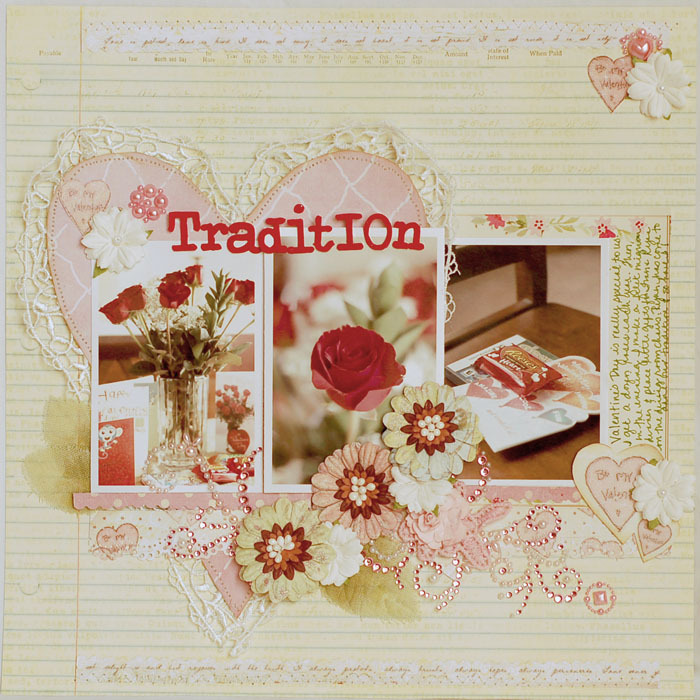 Oh my shabby goodness, Anabelle, I just saw the spread over at Create for CARDS they did on you -- congrats, girlie! The LO in this blog post is STUNNING ... as are ALL your projects!! 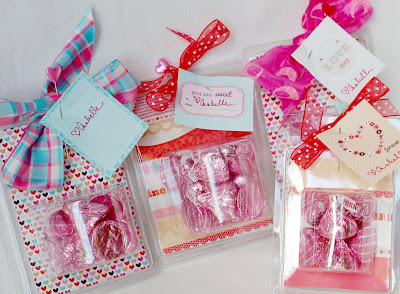 The treat packages are just too clever -- wow, what a FAB way to use old packaging - LOVE! My favorite V-Day tradition is dinner out at our favorite fondue restaurant, a chic flick movie and pretty roses!! Have a wonderful holiday! That is a very very pretty LO - no wonder it made the spotlight! WTG Anabelle!!! I love your valentine's tradition too.. we do something similar. My kids and I bake some Valentine's goodies/dessert each yr - this year is some banana nut muffins decorated with pink and purple icing and eyes and a big kissy lip! I hope to get a photo on my blog today. (last yr was heart shaped cookies) - they look forward to shopping for our baking adventure. Congrats on having Crete show your beautiful layout! These goodies look adorable as can be. My favorite tradition is eating dinner with my honey at the same restaurant each year-Valentines Day is the first time he told me he loved me 15 years ago. Always makes Valentine special for me and makes our children laugh. 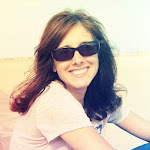 Hi, came to your blog from Create because I loved your layout! Love the one posted here too. What beautiful layouts you do! I just became a new follower, can't wait to see more posts. My kids are grown now, but when they were little I always bought them a small heart shaped box of valentine candy with a favorite character on it and had it at their place at the table at supper. Miss those days! First off, congrats on the Create blog! So well deserved, my friend! Second, we don't have Valentine's traditions. Isn't that sad? I might have to start one though. Happy belated wedding anniversary! And huge congrats on your feature on their blog. Your work is always so incredibly gorgeous and inspiring - you deserve it to be spotlighted:) Really love your layout and the Valentine's creations! Happy Valentine's Day! Congrats!!! And your layout is just beautiful! Love the colors and photos! Here in Norway we don't celebrate valentine like you do. Of course we have taken more and more of your traditions into our country (like halloween as well). But in our house we don't celebrate valentine at all. My parents always give us little treats for Valentine's Day - I am in my 30's and my sister is in her mid-20's, but they still do it and I love it! Your layout is gorgeous! Conhgrats on your birthday; hope you had a terrific day! Congrats on the article! I enjoyed reading the Q & A!! What an amazing layout - love it! So pretty!! Valentine's Day is no big deal here in South Africa but I always make hubby a card (used to buy one but for the last few years he's actually got a home made one) & I like to ensure that I have fresh flowers in the house too!! Congrats! I love looking at your work - it's always so inspirational. Enjoy that V-d yummy dinner tomorrow night. My tradition is no tradition. Just another day here. No biggie. Love your recycled Valentines Day treats. WOnderful!! We're not one for too much tradition around here, but we have managed to organise a babysitter tonight so we can have a date-night. Dinner and a movie..... maybe we can start a new tradition?!! Love the layout and your special treats. Where do you find those candies? I've never seen them before. Congrats on the feature! Congrats! Your layout is beautiful! Valentine's Day I usually cook something yummy and make a good dessert and make everyone a card and enclose a little gift. I saw your spotlight! You are absolutely wonderful and I send you my sincerest congratulations! Genius reuse of the clamshell packaging!! Thanks for the great idea. I don't do this anymore but when my daughter was young, every year I would host a Valentine Tea Party for her and 3 of her friends. I'd decorate in red and white and make food and petit fours and valentine cookies for them to decotate and also they came dressed in valentine colored dresses. It was a lot of fun! What fun I love how the traditions take on a life of their own. We don't really have any traditions, but I do love to celebrate it every year. Cards are a must for everyone that I love so I guess that's the tradition. Other than that it's a free for all. Huge congrats my sweet friend! That layout is just stunning, takes my breath away. Happy Belated Anniversary too! Congrats on your special feature, Anabelle!! Way to go, Girl! Your page is gorgeous! Love that special Valentine tradition you have with your family. And what sweet treats you came up with for your co-workers. The recycling is just brilliant. Wishing you a very happy Valentine's Day, my friend! Happy Valentine's Day a bit late! Your layout is gorgeous - it makes me want to touch it to feel the textures... My tradition, such as it is, is to show my love for others. It doesn't have to be something expensive, it can be something as cheap as a cookie! Congrats girl and well deserved! Valentines is for the kids mostly, I decorate the table, get them balloons, chocolates and cards and make a wonderful dinner for us 4. A private dinner date just us as a family. My kids love it. My tradition is a little odd. We are the average middle-class family and choose not to spend lots of money at Valentines day. Our children always have gotten a heart box of chocolates, a nice dinner and special dessert with xxoo's. Now here is the interesting part. We were married on Valentines day during a blizzard 19yrs ago. A few years ago another blizzard hit on valentines day. My husbands stepfather had recently passed away and we inherited his snow-blower. It was used during that blizzard. The last time my husband had used the snow-blower was on our wedding day. It was a sign. We hopped in the car and off we went. Found the only resturant open and celebrated our anniversary.It was actually an upperscale resturant that opened it's doors to the crews that were out clearing the roads and the occasional couple that was willing to brave the weather. It was the most romantic thing we could have ever done and if another blizzard hits on Valentines day I am sure we will do the same thing. I am new to your blog and I just love the layout you shared with us. On Valentine's Day I always make fun packaging for some kind of chocolate treat for my grandkids. This year it was a cute little gift boxes filled with valentine paper wrapped mini chocolate bars and chocolate kisses. Just seeing this page for the first time, it's gorgeous ! We're not really in Valentine's traditions at home !